The day he was born Keegan was given a stuffed Monkey as a gift. I am almost positive the brand was Gund, almost. I do know that there was a tooshy tag with the name “Michelle” on it. This Monkey was renamed “Mushy” and quickly became a part of the family- even going to the hospital with Keegan when he needed surgery. His favorite part was the left foot which he was always chewing on- I can’t count how many pictures I have of the two of them together. Fast forward 2 years later… I take Keegan to the mall playground and allow Mushy to come with us. Needless to say we left that mall playground without our favorite stuffed monkey. I rushed back a half hour later to try and search for it, but the playground had been closed and cleaned – the cleaning lady said she never saw our stuffed monkey. I filled out a MMR (Missing Monkey Report) and left my phone number, and sadly we have not heard back. It has been 4 days since we lost Mushy, and each nap time and bed time brings sadness with it when Keegan looks frantically for his Monkey to comfort him. We as a family have searched all over the internet for Mushy, with no luck. Lots of cute stuffies, but nothing close to Mushy. 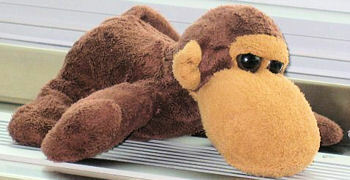 Please, if anyone has ever seen this monkey or maybe even has one in their colection that they no longer need, we would appreciate your help with all our hearts. Wonderful!!! I look forward to being able to mark this one as FOUND!! !